FIGURE 5.23 Reverse-return array piping. Return manifold the modules. The balancing valves must be connected at the module outlet to provide the flow resistance necessary to ensure filling of all modules on pump start up. Whenever possible, modules must be connected in a reverse-return mode, as shown in Figure 5.23. The reverse return ensures that the array is self-balanced, as all collectors operate with the same pressure drop: i.e., the first collector in the supply manifold is the last in the return manifold, the second on the supply side is the second before last in the return, and so on. With proper design, an array can drain, which is an essential requirement for drain-back and drain-down freeze protection. For this to be possible, piping to and from the collectors must be sloped properly. Typically, piping and collectors must slope to drain with an inclination of 20 mm per linear meter (ASHRAE, 2004). External and internal manifold collectors have different mounting and plumbing considerations. A module with externally manifolded collectors can be mounted horizontally, as shown in Figure 5.24a. In this case, the lower header must be pitched as shown. The slope of the upper header can be either horizontal or pitched toward the collectors, so it can drain through the collectors. Arrays with internal manifolds are a little more difficult to design and install. For these collectors to drain, the entire bank must be tilted, as shown in Figure 5.24b. Reverse return always implies an extra pipe run, which is more difficult to drain, so sometimes in this case it is more convenient to use direct return. 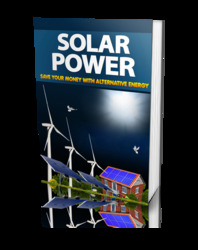 Solar collectors should be oriented and sloped properly to maximize their performance. A collector in the Northern Hemisphere should be located to face due south and a collector in the Southern Hemisphere should face due north. The collectors should face as south or as north, depending on the case, as possible, although a deviation of up to 10° is acceptable. For this purpose, the use of a compass is highly recommended. (b) Internal manifold FiGuRE 5.24 Mounting for drain-back collector modules. FIGuRE 5.25 Row-to-row collector shading geometry. 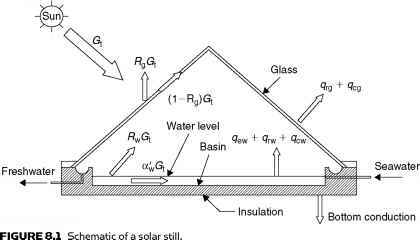 The optimum tilt angle for solar collectors depends on the longitude of the site. For maximum performance, the collector surface should be as perpendicular to the sun rays as possible. The optimum tilt can be calculated for each month of the year, but since a fixed inclination is used, an optimum slope throughout the year must be used. Some guidelines are given in Chapter 3, Section 3.1.1. FiGuRE 5.26 Graphic solution of collector row shading. A graphical solution of Eq. (5.47) is shown in Figure 5.26, from which the bla ratio can be read directly if the shading angle, 9s, and collector inclination, (3, are known. Equation (5.47) neglects the thickness of the collector, which is small compared to dimensions a and b. If the piping, however, projects above the collector panels, it must be counted in the collector dimension a. The only unknown in Eq. (5.47) is the shade angle, 9s. To avoid shading completely, this can be found to be the minimum annual noon elevation, which occurs at noon on December 21. However, depending on the site latitude, this angle could produce very large row gaps (distance b), which might be not very practical. In this case, a compromise is usually made to allow some shading during winter months. A = expansion or contraction of the collector array (mm). n = number of collectors in the array. tmax = collector stagnation temperature (°C), see Chapter 4, Eq. (4.7). ti = temperature of the collector when installed (°C). Expansion considerations are very important, especially in the case of internal collector manifolds. These collectors should have a floating absorber plate, i.e., the absorber manifold should not be fastened to the collector casing, so it can move freely by a few millimeters within the case.